Home > Ask Our Experts > Solar and Wind Power - Are There Limitations? What are the limitations of both solar and wind generated energy on a boat? Could I for instance use solar for perhaps my total refrigeration needs? Could you also recommend sites that would supply more specific information on how I can work out power production with the different types of systems and how this relates to power consumption from the various equipment. Solar and wind power both play a useful role in generating energy for boats but, as you say, both have their limitations, particularly in the somewhat unpredictable climate of the British Isles. With Britain known for being windier than it is sun baked, a wind charger is the more appropriate sustainable power source, particularly if your vessel is being used all year round. You will get more power for your money. The problem, unfortunately, is that you can’t rely on the wind during the summer months. 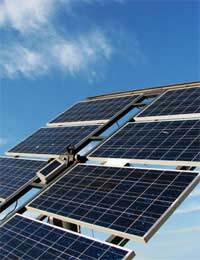 During this period, the longer days and greater sunlight make solar panels a more effective means to generate power. This would lead you to the conclusion that, in terms of all year round weather, wind and solar power offset each others limitations and would therefore ideally work best as a team. In fact many UK boaters do just that and employ hybrid systems. Single regulators are even now available that will connect up both devices to create a unified power supply. Nevertheless, your best option would to be to begin by investing in a wind charger and then assess the need for solar power generation once you become accustomed to the capabilities - and limitations - of the charger. To give you an idea of performance, the Rutland 913 – noted for its good performance in low wind and low noise - can contribute around 30-40 Ah per day to your battery in relatively windy conditions (10-15 knots). This would provide a good source of power for not just for your refrigeration needs but also lighting and navigation equipment, as well as in reducing engine running time. In comparison, a 50W solar panel would add between 12-15 Ah per day to the battery during the summer, a generation which would drop by up to three quarters by the winter time. With power requirements of marine living much lower than in a conventional home due to reduced space and the energy efficient design of boats, you may be surprised at how much power can be generated by wind and solar generators. However, it all depends on how many power-consuming features your vessel has. It may therefore be useful to your research to study your current power usage. Monitors are available that allow you to see exactly where your electricity is going. You can then use this information to relate to statistics detailing the power generated by the different types of wind chargers available. The www.bettergeneration.co.uk website is an excellent resource for detailing the performance of a wide range of small wind turbines at differing wind speeds in its ‘wind turbine reviews’ section. The site also provides instruction on how get a rough idea on the wind speeds in the areas where you are boating, so you don’t need to invest in an anemometer. The website www/windatlas.dk also offers a generalised wind speed map.